Welcome to Lighthouse Coutry on Vancouver Island. 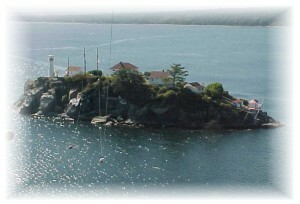 The smaller coastal communities of Qualicum Bay, Horne Lake, Bowser, and Deep Bay lie between the lighthouses located on Sisters Island to the south and Chrome Island, off the south tip of Denman. For waterborne adventures, including fishing, kayaking, sightseeing or diving, this is the place to start. Marina, charter, and launch facilities are located all along the coast. Recently, a group of local restaurant and store owners decided to show the world how nice the weather really is in the area, so don't be surprised to see palm trees growing in a number of locations! Nice weather encourages lots of outdoor activities, including golfing, hiking, mountain bike riding, or the old standby, beachcombing. One unique local activity that isn't affected by the weather is spelunking in the Horne Lake Caves. It's safe and fun for the whole family, with qualified guides ready to show you a world few have ever seen. Aboveground, underground, or underwater, that is the question, and the answers lie in Lighthouse Country! 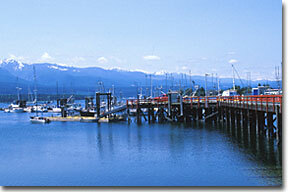 Drive north on the Oceanside Route 19A from Qualicum Beach, or exit the Inland Hwy. 19 at Cook Road (Exit 87) or the Horne Lake turn-off (Exit 75). This area provides access to some of the most pristine natural wilderness, beautiful parkland, crystal clear lakes and ancient caves. The trees are huge, the area is green all year round, and the scenery is breathtaking. Visit the docks at the excellent natural harbour at Deep Bay to watch the commercial fishing boats return with their catches. Deep Bay's prolific herring spawn and shrimp hatches attract the larger Chinook salmon, some up to thirty pounds. Nicely sheltered by Mapleguard Point, Deep Bay launches sport fishing boats for the rich coho and chinook salmon grounds along the coastline and offshore islands and rocks. Anglers' dreams are fulfilled for both fresh and salt water catches. Baynes Sound offers excellent and easily accessible birdwatching, and is also a popular viewing area for Bald Eagles. Baynes Sound is used extensively by Western Grebe, Common Loon, Trumpeter Swan, Brant, Mallards, American Wigeon, Green-winged Teal, Bufflehead, and mergansers are common. Bald Eagles congregate in large numbers at the mouth of salmon streams during winter. A colony of Brewerâ��s Blackbird has been known to nest on a gravel bar in Rosewall Creek. Combining natural scenic beauty with a wide variety of unique beachfront motels, cottages, bed & breakfasts, RV parks and campgrounds, visitors to Lighthouse Country can enjoy a wealth of outdoor activities, and are sure to leave with fond vacation memories. Lighthouse Country boasts world-class artists and artisans. Just off McColl Road, Wildwood Park beckons travellers to stop and rest. An existing 1-km trail will ultimately become the northern trailhead of a proposed Lighthouse Country Hiking Trail, stretching south to Qualicum Bay. The communities are located within a 20-minute drive to many of the top golf courses in the area, including the Arrowsmith Golf & Country club, an 18-hole full-service course with clubhouse. Horne Lake Caves Provincial Park is located along the Qualicum River, southwest of Qualicum Bay. The 123-hectare park protects seven caves in the Horne Lake Cave system, named after a Hudson Bay Company explorer. Dress warmly and appropriately for caving, and carry a flashlight. Other adventures include canoe and water safety instruction on Horne Lake, kayaking, horseback riding, mountain biking, hiking and fishing. There is a private campground adjacent to the park with a boat launch. Spider Lake Provincial Park encompasses Spider Lake and its shoreline, south of Qualicum Bay. This quiet and peaceful 65-hectare park is a day-use only recreation area, and a great place for a family outing, with the warm water lake being noted for its excellent swimming, canoeing and kayaking potential. Paddlers can spend a peaceful afternoon exploring the shoreline and the many secluded bays. Shaded lakeside trails and a lovely sandy beach make Spider Lake a favoured destination. Just north of Deep Bay on Hwy 19 you'll find Rosewall Creek Provincial Park, a small roadside park devoted to riverbank casting at the entrance to Qualicum Bay. Rosewall Creek is an important winter habitat area for waterfowl and shorebirds. Take a break from the beach and drive north to Buckley Bay for a visit to Hornby Island and Denman Island, located just offshore from Lighthouse Country. These tranquil and enchanting southern Gulf Islands are accessed by a 15-minute ferry ride from Buckley Bay to Denman Island, and a second ferry trip to Hornby Island.